← Marvel’s AVENGERS: Age of Ultron in theaters NOW! Disclosure: This post is sponsored by Florida College Prepaid and Bloggin’ Mamas, opinions and experiences are 100% my own. When I graduated high school, there was no financial plan in place for me to attend college. With three kids in the house, my mom and stepdad had to make end meet weekly, and there was no one to give them advice on how to best save for their children’s futures. I worked a part time job and with a little help from my parents paid my way through local college. I was fortunate enough that halfway through my college career I began working for the University of Miami, and because tuition remission is an employee benefit, I was able to obtain my Bachelor’s degree after completing Associate degree. Not every child has a scenario like mine, or earns scholarships to prestigious schools. In fact, those scenarios are few and far between, the most common scenario is that of parents struggling to pay for their child’s higher education, putting it on credit cards and owing thousands of dollars in student loans. These days, student loan debt has reached $1 trillion nationally. With my eldest finishing his first year of middle school, and my youngest already halfway through Elementary School, my husband and I know we have to start planning for what lies ahead. Thankfully, these days parents have several options to prepare for this milestone. Money from a 529 plan can be used for tuition, fees, books, supplies and equipment required for study at any accredited college, university or vocational school in the United States and at some foreign universities. The money can also be used for room and board, as long as the fund beneficiary is at least a half-time student. Off-campus housing costs are covered up to the allowance for room and board that the college includes in its cost of attendance for federal financial-aid purposes. Qualified education expenses do not include student loans and student loan interest. There is legislation currently going through Congress that will expand the qualified expenses. Florida Prepaid is the largest, longest running and most successful prepaid program in the nation and we are here to help Florida families understand the importance of investing in education and make it is easy to do so. Florida Prepaid offers two types of savings options: Prepaid Plans and 529 savings plans. There are five different types of Prepaid Plans, and they can only be purchased during Open Enrollment (which usually runs from Oct.-Feb.).Every college savings plan opened with us represents an investment in a child’s future, and in our state. The Florida 529 Savings Plan can be started at anytime and only requires a $25 initial deposit to open. Even if you can’t save for your child’s entire college education, starting something is always better than doing nothing. The funds in a Florida 529 Savings Plan can be used for any qualified higher educational expense, including tuition, room & board, textbooks, graduate school and much more. This gives you extreme flexibility to use the funds as you see fit, for whatever your child may need. And should those needs change during his/her college years, individuals are free to adjust as well. Have you started planning yet? If not, today is a great day to start: it’s National 529 Day. 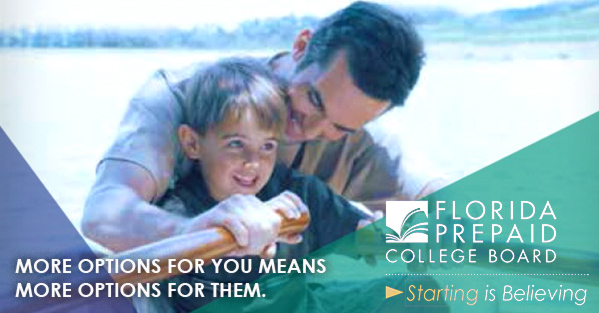 I encourage you to check out the college planning options at http://www.myfloridaprepaid.com/what-we-offer/529-savings-plan/. This entry was posted in Deals and Discounts, Family & Friends, Parenting. Bookmark the permalink.